This is an Index to our material related to Andy Warhol's Tom Seaver painting. One of ten done for the Athlete's series. Rather than go into a lot of detail on Andy Warhol's 1977 painting of Tom Seaver here, I have broken down the information into smaller columns focusing on specific aspects or stories about the painting. The related links are below. Ok the busy/lazy blogger that I am missed an Anniversary. 25 Years ago the Phillies held the home opener for their 1993 Pennant Winning season. The 1993 Phillies opened at Houston and took all 3 games from the Astros. The Phillies returned home hosting the Cubs in front of 60,985 - the largest opening day in club history - and Team Phungo was there for the game. As one can tell in 1993 I was not very picky about taking card of my souvenirs. This is the first major league ticket that I ever had with a play photograph. It was pretty special for the era. Oddly since then we have gone through a period when almost all tickets had pictures to the current situation where we don't use hard tickets at all. Regardless, I loved it at the time and I still love the tix today. 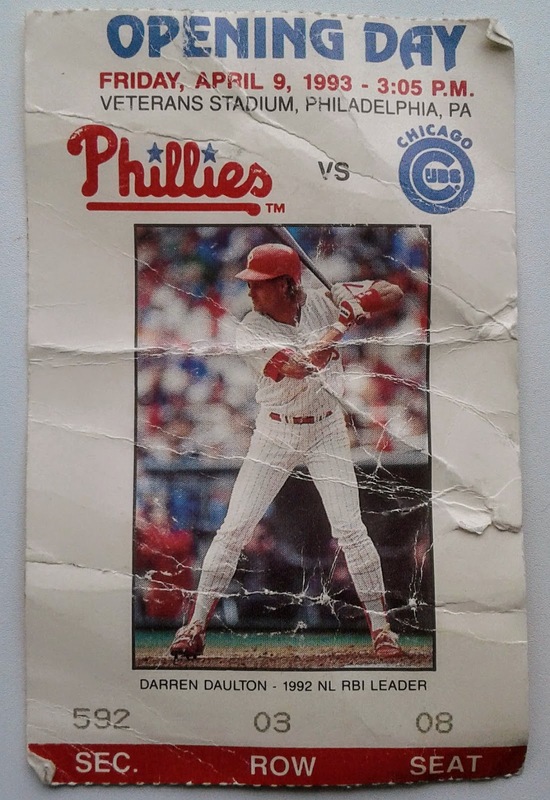 Note that below the photo the card err I mean ticket honors Darren Daulton by mentioning his 1992 RBI crown. Well on his Ticket Photo day, he had a helluva day which included 5 RBI on a pair of Home Runs. So we have our star player on the tix, and the tix mentions RBIs and he piles on 5 RBI. Well Done Dutch! Unfortunately that was not enough as the Phillies lost to the Cubs 11-7. The Phillies fell to second place a half game behind the 3-0 Pirates - It was the only day the 1993 Phillies fell out of first place.